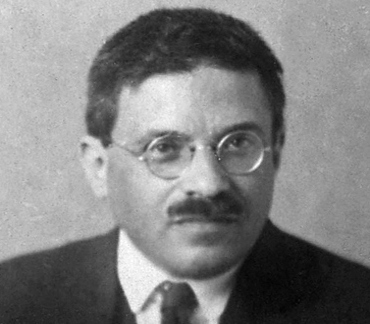 Ehrenfests Beitrag zur modernen Physik ist vor allem sein berühmter Artikel über statistische Mechanik von 1911 und das nach ihm benannte Ehrenfest-Theorem (1927), ein Satz der Quantenmechanik, der eine allgemeingültige Beziehung zur klassischen Physik herstellt. 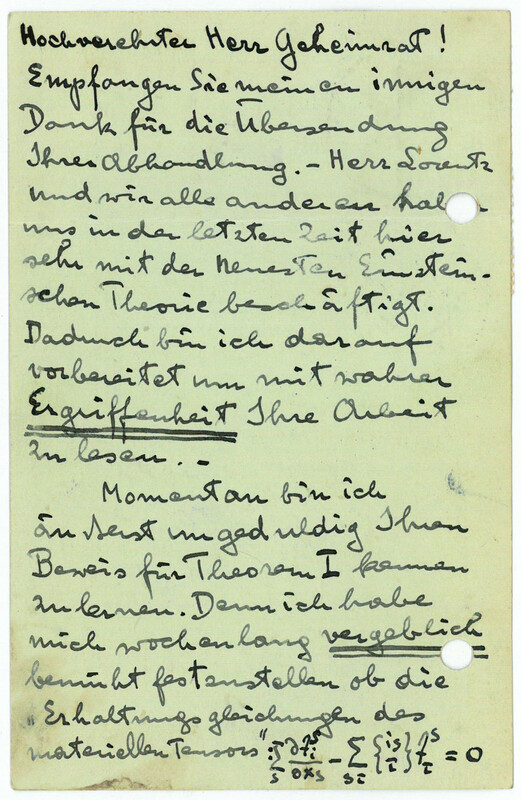 Noch heute oft diskutiert ist das von ihm 1909 aufgestellte Ehrenfestsche Paradoxon, ein scheinbares Paradoxon der speziellen Relativitätstheorie (SRT). Äußerst fruchtbar waren die dabei aufgeworfenen Fragen auch für die Entwicklung von Albert Einsteins allgemeiner Relativitätstheorie, da Einstein dadurch auf die Bedeutung der nicht-Euklidischen Geometrie aufmerksam wurde. Atomphysiker (1880-1933). Autograph postcard signed, and with some mathematical calculations. Leiden. 2 SS. (Qu.-)8vo. Mit eh. Adresse und wiederholtem Namenszug im Absender. 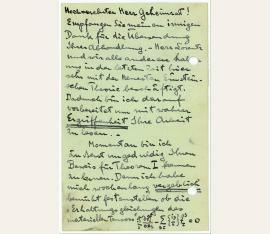 In German, thanking the mathematician David Hilbert for sending him his latest scientific treatise, and mentioning his current preoccupation with Einstein's theory: "[...] At the moment I am extremely impatient to get to know your proof of Theorem I [...]". - Small loss of singular letters through punched holes, otherwise in good condition. 3 eigenh. Briefe mit U. und 1 Originalphotographie. Friendly correspondence with a Natasha who at that time was apparently close to Ehrenfest's wife Tatjana. Ehrenfest promises to write to both of them, goes on to develop some thoughts on mechanics and physics, and wants them to ask Joffe, Frenkel, Bursian, Krutkov, and Friedmann in case they do not understand what he has written. He encourages Natasha not to become frustrated by her own scientific work , since "everyone who has become involved with science faces the same problems [...] You should see how Bohr and Einstein were tormented [...]" (transl.). 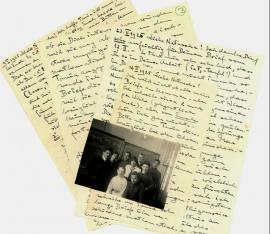 - The picture shows Ehrenfest with some of his students.